ABOARD THE OPEN ARMS IN THE MEDITERRANEAN SEA – The full moon was the only light as a terrified 9-year-old boy from Central African Republic climbed into a rubber dinghy held together with duct tape, risking death in the dark waters off Libya along with his parents and 57 other trafficked migrants. Their savior Saturday was the Open Arms, which became the third rescue ship run by humanitarian aid groups to draw the ire of Italy’s anti-migrant interior minister, Matteo Salvini. He has vowed that Italy’s new populist government will no longer allow such rescue boats to dock in Italy, which has taken in hundreds of thousands of migrants rescued at sea in the last few years. Malta then angrily rebuffed Salvini’s claim that the tiny Mediterranean nation was closest to the rescue ship and should give it safe harbor. The Open Arms and its companion ship, the Astral, will likely need four days to reach Barcelona, said the Astral’s captain, Riccardo Gatti. Also on Saturday, in an unrelated rescue much further west of the central Mediterranean where the Open Arms rescue took place, Spanish authorities reported saving 63 migrants trying to reach the country’s southern coast from North Africa. The 39-year-old man from Cameroon said that he was sold twice as a slave, kidnapped and tortured in Libya while awaiting his chance to get aboard a smuggler’s boat. His brother sold his home in order to pay the ransom demanded by his captors in largely lawless Libya. “It’s better to die than to continue being treated this bad,” he said. A few hours after the Open Arms rescue Saturday, Salvini declared that the Spanish rescue boat “can forget about arriving in an Italian port” and claimed it should go to Malta. “Quit spreading incorrect news, dragging Malta into it for no reason,” Maltese Interior Minister Michael Farrugia tweeted, claiming the tiny Italian island of Lampedusa, south of Sicily, was closer. Fico described Libya as unsafe and praised the humanitarian aid ships for doing “extraordinary work” in the Mediterranean. Salvini contended Saturday on Twitter that the Open Arms had taken on the migrants before a Libyan boat in Libya’s search-and-rescue zone could intervene. 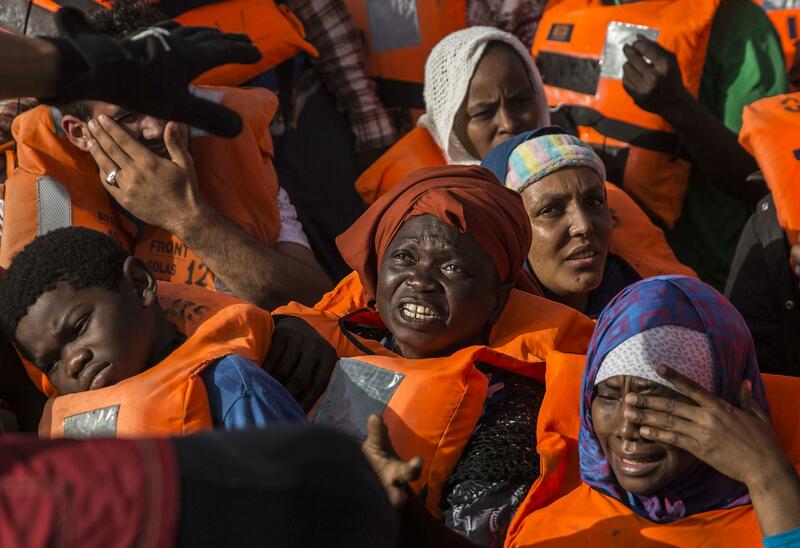 But the Open Arms’ captain said he told the Rome-based Maritime Rescue Coordination Center about the migrants and was instructed to call Libyan maritime authorities, who didn’t answer. The captain said officials in Rome then told him it was up to him to decide whether to carry out the rescue. “I took the decision to save these human beings,” the captain, Marco Martinez, told an Associated Press journalist who viewed the rescue from a dinghy belonging to the Astral. Published: June 30, 2018, 9:13 a.m. Updated: June 30, 2018, 3:06 p.m.